Closing remarks by George Mavrikos, General Secretary of the World Federation of Trade Unions (WFTU), at the 17th World Trade Union Congress held in Durban, South Africa. First of all, I want to express my appreciation for the trust you demonstrated towards me by electing me as General Secretary of WFTU. On behalf of PAME and the class-oriented trade union movement of Greece we thank you for your repeated support. With my reelection, I feel an ever greater responsibility towards you and I commit to give all my best efforts to the struggle for the strengthening of the WFTU and the emancipation of the international working class. Since my election in 2005 in the position of General Secretary, I always tried to maintain with you a comradely, honest, straight and clear relation. This is how I want to continue to be today and therefore I inform you that this will be my last term as General Secretary of WFTU. In the next Congress, we will elect a younger comrade with the appropriate criteria. We have capable, worthy and dedicated fighters in the WFTU family. One such militant we will select collectively and we will trust upon him the leadership of our Organization for the years to come. It is our duty, our obligation to actively help – not only in words - for the development of new cadres. And it is an obligation, at the same time, for the leadership to know, to understand, to realize when it is time to step down. A leader of the class-oriented trade union movement must step down and not be thrown out. When time comes he must give space to younger comrades. Our movement has many worthy cadres. No one is irreplaceable. Irreplaceable are only the ones lying in their graves. Allow me to express my gratitude to all those behind the scene who worked hard for almost a year for the organizing of this Congress. I want to thank our South African Comrades, Zola, Lucian, Lulamile, Zanele, Scumbuzo, Ntombi, Luphert and so many others as well as the the staff of the Central Offices of Athens, the translators, the drivers, journalists who are here today and all the staff of the ICC and the hotels. On behalf of all the delegates and the observers we express our appreciation and love. Allow me now to move on to the Conclusions of the Congress. My first conclusion: Is that this was a Congress that was open, democratic, class-oriented and internationalist. A Congress that befits and reflects the history of the 71 years of the WFTU. We heard 112 speakers from 103 countries. They spoke freely. They made their proposals; they made their criticism, some of them also made self-criticism. Self-criticism has a special value because it needs courage to make honest self-criticism and self-criticism together with comradely emulation and criticism are the basic tools for the improvement of the militant. Our Congress works during all days were open to all Mass Media, to all observers and guests, The Administration of the Congress and the operation of the Committees were in good level. We voted yesterday with secret ballot organized by the IEC (Independent Election Committee) and we elected a General Secretary. We voted democratically and freely for over an hour and we elected as new President of the WFTU, comrade Mzwandile Makwayiba. His election is a new positive step for our organization and also underlines the priority we give to the African Continent and our effort to strengthen the trade union movement. Also in about an hour there will be a second secret ballot also organized by the IEC of South Africa to elect the new Presidential Council and the new Financial Control Committee. A little while ago we approved all together by vote the new Program of Action, the Platform of Action 2016-2020 which was presented on behalf of the Resolution Committee by comrade Swadesh Devroye. A resolution which is ambitious and realistic, it is contemporary and necessary. A resolution which is a result of the pre-Congress proposals and the discussions held during our Congress. What does this general picture prove? The democratic character, the open, unifying character of our Congress. The Second Conclusion by the Congress is: There are new organizational duties for all of us. Even greater responsibilities for our cadres. Greater tasks, more serious expectations for the organizational strengthening of the class-oriented trade union movement. Because only a movement which is organizationally solid, massive and militant can effectively and successfully defend its members and all the workers. Therefore, all of us here today we vote in a unanimous voice that the decision that we will put all our efforts so that in our next Congress, the 18th Congress, we will have 100 million members in our ranks. We will all work will plan, with supervision for this target. We can achieve it. Our aim is to strengthen the trade union movement in the base. Inside the workplaces, in the multinationals, in the sectors, in the regions, in each country in every corner of the planet. We need trade unions that are lively in the base, massive, uniting workers against exploitation and bourgeoisie. We want trade unions of the base which will be real schools for the working people teaching them everything that has to do with class struggle. We want trade unions that can operating within the wide masses. Not closed clubs, not bureaucratic leagues or small elites but open militant schools. I continue in the organizing level, for us to underline the need to improve the function of the Presidential Council and the Secretariat. Our meetings need to be more substantial, more specific, thematic and to avoid generalities and simple description of problems. We are not writers for describe the situation in our countries and our sectors. We are cadres, leaders bearing the duty to accumulate forces and to organize class struggles in order to change the world and make it socially just. We have the same expectations from the Regional Offices and the TUI’s. Many speeches mentioned the role of the sectoral organization and gave valuable and correct examples. All claimed that today with the multinationals, the cartels, the merging of companies and the privatizations, the role of the TUI’s becomes more enhanced. Hence, more help, more attention, more care must be given. The women who spoke, the young comrades, the migrants presented vividly the organizational need to enhance and to operate the relevant Committes. Working women, working youth, migrants and refugees are right to have many expectations from the WFTU. We also propose to decide to formulate a Committee of Lawyers and Scientists who will defend the trade unions and the workers in need. Furthermore, we all agree to authorize the new Secretariat to study, analyze and bring an informed proposalfor the foundation of new TUI’s and new Regional Offices. From today on we will give our approval for the foundation of the Office of WFTU in the Eurasian Region based in Moscow. The third conclusion that comes from the Congress and many speeches is the need for the enhancement of our trade unions in ideological and political level. We do not operate in a sterilized environment. We live and struggle amongst friends, opponents and enemies. Therefore we need our Organizations and our leadership to have a clear understanding who we are and where we go. We are correct to struggle for better wages. We are correct to strike against privatizations, we are correct to demand collective bargaining agreements, conditions of health and safety, public and free education, Health, better environment. All these are within our basic role. We have to continue to fulfill this role. At the same time, as trade union movement – at the same mere moment – we have to radicalize our demands. We have to uplift the content and the forms of our struggle with the direct aim of the emancipation of the working class from the capitalist exploitation. To make the working class the pioneer and leading class ready to fulfill its strategic purpose. It is a form of art to combine the struggle for the daily problems, for the direct and imminent needs of the popular family with the struggle that will uplift the level of consciousness of the popular strata who will not stand to live any longer in this filthy regime of exploitation. Hence, if there are any who think “let’s fight today for the wages and later I will fight to enhance the consciousness of the masses”, they are making a great mistake. You cannot fight against the privatization of the mine on the one month of the year and the next year struggle to convince the workers that wealth belongs to them. It is impossible to fight this year for collective bargaining agreements and a year later to say that you will fight for emancipation. Class struggle divided in sterilized boxes does not exist. Our main instruments for the empowerment of our ideological objective is internationalism, the unity of our class and our militant line of struggle. We think that all the speeches supported and enriched all we topics we mentioned in the opening speech. Therefore we are in agreement and we move forward. In this point, I would like to highlight the good and clear ideological and political level will help us in our confrontation with the international bourgeoisie and its mechanisms, its puppets inside the Media and the leaderships of trade unions. The capitalists today are better organized in their own associations; they have stronger mechanisms everywhere, they have controlled all the International Organizations, they have intensified their aggressiveness against the trade unions and the militants of the trade union movement. To correctly confront the attack of the employers we must be equipped with theoretical and ideological knowledge so that in combination with our organizational power we can defend and attack. Each time with success in the time and place. The fourth conclusion: We must believe in our own power, in the power and the superiority of the class-oriented trade union movement against the tactics of the yellow trade unions. The yellow trade unions are a danger to the trade union movement because in reality they divide the working class, they support the capital, the multinationals and the monopolies. They are allies and puppets of imperialism. The yellow trade unions have many financial resources to corrupt trade unionists, to buy-off consciousnesses. We, as the family of WFTU, we have to convince the new generation that the struggle is worth it. We have to be the positive example in order for the trade union movement to regain its prestigious position. Only the militants of the class-struggle can undertake this role and bring back wide popular masses in the trade unions. We have moral, ideological and political superiority over the yellow trade union leaderships. We have moral, ideological and political superiority in human resources, our cadres. We have cadres who they cannot buy-off even if they spend all the diamonds of the African land. We do not sell-out our ideology. We do not sell-out our history. We do not betray our Class. I see here in front of me comrade Nazario from Peru and I recall how much blackmail he received in Geneva during June in order to withdraw the statement of condemnation of WFTU against the Government of Chile! In the middle of the nights Embassies of Peru and Chile, Ministers, bureaucrats and yellow trade unionists would call him and threaten him! Nazario did not bend. He did not give up. “I am with WFTU” he said on and on with pride. Well done Nazario! Congratulations! We thank you for the message you gave with your stance. And down there on the back is Emil Olsen, this young comrade from Denmark. He was kicked out from the committees of his union because he is in the WFTU. 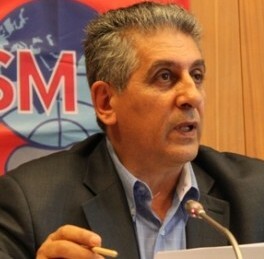 He was asked to abandon the WFTU or he would lose his job. He remained with the WFTU. He lost his job but gained tremendous respect in the sector of Construction workers in Denmark who acknowledge him as their true leader. These are our cadres. This is our treasure. This is the response of the WFTU to all those subordinated trade unionists who supposedly give us a friend pad on the shoulders saying: “My heart is with the WFTU but…”. Collaborators, you lie! You even try to kid yourselves. Both your heart and your pockets are with the yellow trade union leaderships. I conclude my dear comrades with an appeal to all of you to circulate openly, widely to the masses the message and the resolutions of our Congress. We must struggle all together for the implementation of the resolutions. We must project the value and the need of the struggles in the modern world. To defend with all our means the sacred right of Strike. To become genuine followers of the glorious history of the 71 years of the WFTU. To tell the workers that when we mention the History and the Struggle of the WFTU we do not do so out of nostalgia. We do this to utilize the positive and the negative lessons and to build the strong class-oriented trade union movement of the future. And without a yesterday you cannot build the today and the tomorrow. We honor the martyrs of our struggles. We have our feet grounded on the earth and we are looking ahead. All of us here, we commit ourselves that with our action we will put our signatures, we will write our names in the new, contemporary, militant pages of the history of the WFTU. Long live the working cass of Africa!